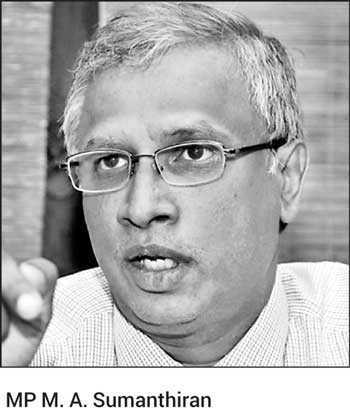 Tamil National Alliance (TNA) lawmaker M. A. Sumanthiran yesterday warned the Government that the party will take action to support an international investigation into alleged war crimes unless the Government agrees to time-bound implementation of the UNHCR resolution. He said that for the Foreign Minister’s statements in Geneva to be realised, the Government must find mechanisms for reconciliation within the country and they must be adhered to. “It is only through the participation of foreign judges can independence be assured. In a matter where the contesting parties or the warring parties include on one side the state of Sri Lanka and on the other side a militant group that had the objective of dividing the country, the state of Sri Lanka cannot be an independent arbiter, and it is because of an independent judicial mechanism that nobody can complain about that we have asked for participation of foreign judges. If that is not adhered to, and the commitments given to the International community are breached, then the country will have to face a tribunal that is entirely international,” he added. Sri Lanka has yet again co-sponsored a resolution which was adopted at the UNHRC on 21 March unanimously by all member countries. Sumanthiran noted that the resolution underscores Sri Lanka’s commitment to adhere to the promises made in resolution 30/1 that was adopted on 1 October 2015 with the co-sponsorship of Sri Lanka. Sri Lanka has co-sponsored the resolution three times, resolution 30/1 on 1 October 2015, 23 March 2017, when resolution 34/1 was adopted, and 21 March, when resolution 40/1 was adopted unanimously. Quoting operational paragraph 6 of resolution 30/1, he said it “welcomes the recognition by the Government of Sri Lanka that accountability is essential to uphold the rule of law and to build confidence in the people of all communities of Sri Lanka in the justice system. It notes with appreciation the proposal of the Government of Sri Lanka to establish a judicial mechanism with a special counsel to investigate allegations of violations and abuses of human rights and violations of international humanitarian law as applicable, affirms that a credible justice process should include independent judicial and prosecutorial institutions led by individuals known for their integrity and impartiality and also affirms in this regard the importance of participation in a Sri Lankan judicial mechanism including the special counsel’s office of commonwealth and other foreign judges, defence lawyers and authorised prosecutors and investigators”. Four types of persons are referred to in this resolution to function in the Sri Lankan judicial mechanism, which include foreign judges, defence lawyers, and authorised prosecutors and investigators, he said. “This is the commitment that even yesterday, Sri Lanka has signed and co-sponsored and enabled the passage of a resolution. It is false to say that we have not agreed to the participation of foreign judges. There is authoritative text to which Sri Lanka has signed to three times over. In that text, Sri Lanka has very specifically agreed, and anybody who understands English can understand that there can be no other interpretation referred to the categories by their office, judges, defence lawyers, and authorised prosecutors and investigators. But despite this, I am sad that the Foreign Minister who led the delegation on 20 March at the UNHRC has stated what the President and the Prime Minister and various others have been saying for some time, that there is no space for foreign judges to participate in the Sri Lankan judicial process. That is false. If that was so, this could not have been signed by Sri Lanka. At the time it was signed, in October 2015, I was in Geneva and so was Minister Wijeyadasa Rajapakshe, on behalf of the Government. As the Minister of Justice, he raised this issue and then he agreed that it is possible under the Constitution to have foreign judges,” said Sumanthiran. He added that it is upon Rajapakshe’s agreement that 30/1 was signed. “In fact, it is Wijeyadasa Rajapakshe who, in 2013, presented to this house a private members bill as an Opposition member for the investigation and inquiry into judges of the Supreme Court during the Chief Justice Shirani Bandaranayake impeachment saga, presented a private members bill which provided for foreign judges. If Wijeyadasa Rajapakshe thought that it was unconstitutional, he could not have done that. In fact, article 105 of our Constitution lays no restriction and article 111 with regard to the High Court lays no restriction with regard to the nationality of judges. It is false to say that the Constitution prohibits the participation of foreign judges. It does not prohibit. There are judicial decisions in this regard,” he said, adding that unlike in the case of the Indian and Pakistani constitutions, Sri Lanka’s Constitution does not contain any guidelines qualifying or restricting or circumscribing the acts of appointment of judges. Therefore, he said there is no legal or constitutional bar for foreign judges to participate in the judicial mechanism and in fact, the Government has accepted that and acceded to that position. “It is also important to note that whatever be the rhetoric of the Minister of Foreign Affairs in Geneva, the Government has now agreed to this. And also agreed for the first time in 40/1 that was adopted on Thursday, a time-bound implementation which has been brought in for the first time in this resolution because the Government has been extending and delaying the implementation of all of these promises made in the UNHRC,” he noted, pointing out that it is because of this that these other resolutions, 34/1 and 40/1, are being categorised as time extensions.